Pallet Racking Inspections are an annual safety check on the condition of your racking. A Required inspection as part of the 1998 Provision and Use of Work Equipment Regulations. Providing the customer information on what is safe and what needs repairing supplied via a Red Amber Green System. The problem with this process is that the majority of warehouse owners only do the required minimum when it comes to the safety checks. But what happens if an upright is damaged the day after your independent pallet racking inspection… is it okay for it to go unnoticed for another 12 months? Simply, no! The endless potential in danger is something Rack Training want to cut out from warehouse environments. Rack Training’s two day pallet racking damage inspection course ensures nominated staff are trained to spot damage within the warehouse. It provides confidence in having the knowledge to advise on the correct precautions to take to ensure safety. With your staff trained to spot damage, more frequent pallet racking inspection can take place. Not only does this mean your warehouse will be a safer environment to work, it also gives your company the opportunity to stagger repair costs throughout the year rather than a big annual sum to pay. 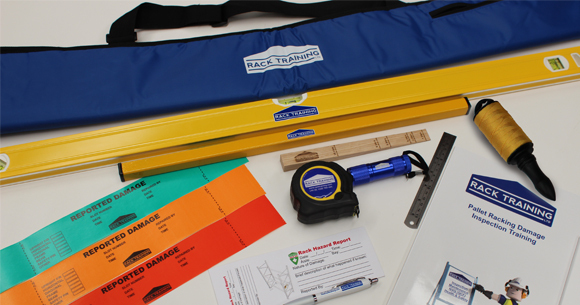 By taking the course, candidates will also receive a free pallet racking inspection kit. (RRP £44.95) We want to be sure you have everything you need to carry out an inspection once you’ve completed the course. Yes, you will still require your independent racking inspections. (Click here to find out more information on The Rack Group’s inspections) But you should find a significant reduction in damage and therefore costs. Click here to contact us. Our friendly team are always happy to give help and advice.